I'm rather ashamed that as a New Englander and lover of history, I haven't spent all that much time in Boston - especially considering it's only about two hours away from where I live. I've only been a handful of times but every time I've gone (with the exception of trips to Logan Airport as those trips don't really count!) I've really enjoyed myself as it's really quite an interesting city and so different from cities like New York or Los Angeles. I've always thought that it would be nice to take one of the many sightseeing tours that are available so that I could see more of the city in a shorter amount of time but I've just never gotten around to doing that either. I have a cousin who lives in Shirley, outside of Boston, and her family took one of the many Duck Tours that are available in Boston and they loved it. I'm still not too sure how much I trust a land-water vehicle but I don't think anyone has drowned on one of those tours yet! The last time I went to Boston was this past September when I went up for a Sa turday with a friend from work. Liz and I had a great time checking out all the stores on Newbury Street which until the mid 1800s was actually part of Boston Harbor. 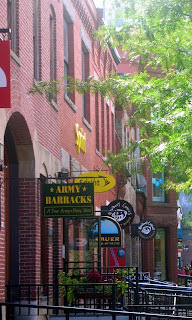 Beginning in 1857, the harbor was slowly filled in to become the Back Bay section of the city and that was when the 2-mile stretch that eventually became one of Boston's most enchanted streets filled with unique shops, boutiques, and restaurants most of which are located in renovated brownstone buildings. The more expensive shops are located on the end of the street closest to Boston Public Garden but as you walk towards Massachusetts Avenue they gradually become slightly less expensive and more bohemian. Liz and I poked our heads in a few as we walked the entire lengthy of Newbury Street in both directions. Another fun part o f our day in Boston was when we stopped by the Bull & Finch bar on Beacon Street which is more popularly known as the bar where the TV show Cheers was based. It's the bar where supposedly "everyone knows your name" but as it turned out no one there actually knew my name at all! It was still fun to pose for pictures and pretend that I was as smart as Cliff Claven for a little while! "It's a little known fact that the tan became popular in what is known as the Bronze Age." Yessiree, that Cliff was certainly a scholar, wasn't he? 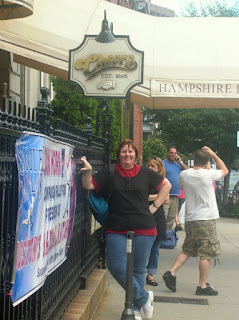 Before I go up to Boston again (and now that I've got a blogging buddy living up there it shouldn't be too long! ), I'm going to see if I can win a handheld GPS by signing up for the Trusted Travel eNewsletter from "Trusted Tours & Attractions". Their eNewsletter is designed to supply tourists with informative, useful, and practical articles as well as money saving deals and if I sign up before January 31st I'll be entered into their contest to win a handheld GPS which would come in really handy when I can't remember in which the direction the Northend of Boston is and I'm craving a cannolli and an espresso! 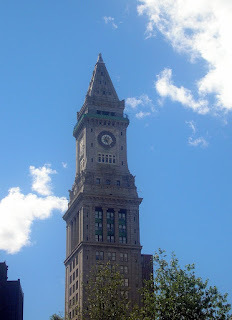 I most definitely want to spend more time in Boston this Spring and Summer as it's a gorgeous city packed with history and culture and all sorts of fun things to do. Add on the fact that it's close to home - and I can almost speak the language - so it's definitely on my list of things to do! All in all it's a wicked place to visit and with Mags now living in Allston, there's at least one person up there who knows my name and that's certainly a start, isn't it?? 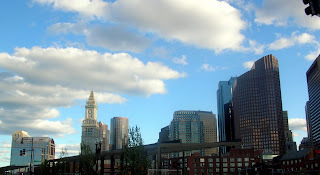 Boston, my home since coming up here for college so many years ago, is a very interesting city, I must agree. I've only been to that area of the country once, so far. That was to visit my daughter in New Hampshire this past September. We came in through Logan, but didn't do any site seeing in Boston. But we did pay a visit to Salem, MA. That was a good time. As for the Duck tours, Linda. We took a tour by Duck in San Juan, PR. It was a great way to see the area around Old San Juan. They really are very stable in the water. One history buff to another Linda, I'd absolutely love to have the opportunity to visit Boston! The shops and such like that don't grab me all that much but the places where so much of our Revolutionary period history took place - now that does it for me. 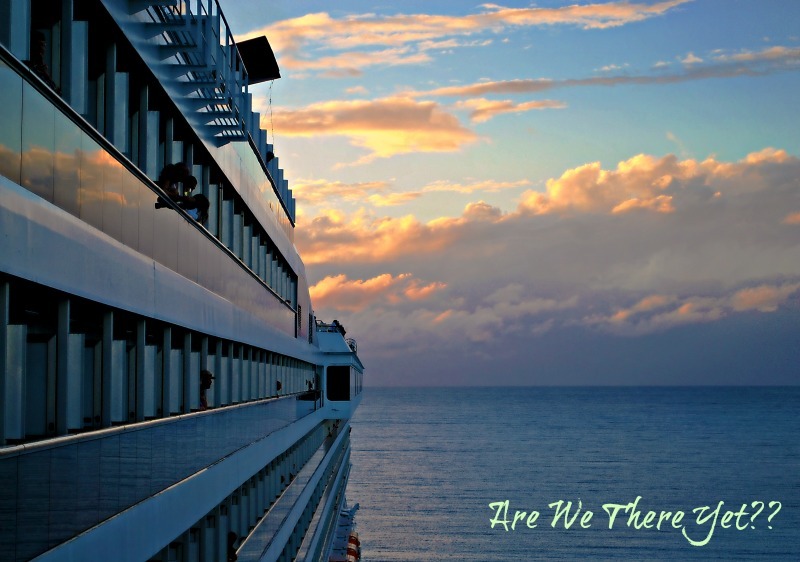 I just think that would be a really neat place to go see - along with lots of other stops in New England too.